Home∕Credit Cards∕What Happens to My Miles When I Close a Credit Card? What Happens to My Miles When I Close a Credit Card? In response to reader feedback I’ve written this post. If you have other questions feel free to leave a comment, email me: samsimontravel@gmail.com, or message me on Twitter. If you remember back to the post “The 11 Month Itch: How to Avoid Annual Fees.” Milenomics doesn’t usually advocate paying an annual fee for a card. The tips and tricks in that post are great ways to avoid an annual fee. When it comes time to avoid that fee Milenomics advocates either a downgrade to a fee-free card, or merging the credit line to another card you have with the same bank. Today we’ll build on this with a clear discussion about what happens to your miles when you downgrade, or merge the credit line. In essence, what happens when you close the miles earning card you had open. Examples of these cards are the co-branded cards we applied for in our last CCC applications. AA Mastercard, BA Visa, UA Visa, and US Mastercards. Cards that fall into the Open System category usually have an airline logo on them. The reason Milenomics treats them as an open system is that the cards generate miles, which are transferred from your card issuing bank (Citi, Chase, and Barclays) into your own Mileage account with the airline each month. The system is open because the miles flow out from the bank and you retain ownership of those miles. Once these miles are in your account they’re yours for as long as the rules of that program say they do not exprie. AA/US/UA miles all expire 18 months from the last activity. Southwest miles expire in 24 months, and DL miles never expire. Milenomics Tip: Keeping miles alive without a credit card is very easy. Sign up for an account with the airline shopping portal of your choice. One small purchase at drugstore.com, especially if you have a shoprunner account, is always a great way to keep miles alive. Don’t wait too long, it takes about 3 weeks for miles from drugstore.com to post. My Go to is this lip balm, which is $1.99 and shoprunner compatible. So for $2 plus tax (Free shipping) your miles stay safe for another 18/24 months. – Every month your mileage expiration date is extended (for applicable programs). – Usually include airline perks, like free checked bag, and priority boarding. – Cancelling the cards has no effect on your mileage balance, as miles are held in your own account, not a bank generated account. Chase Ultimate Rewards cards, American Express Membership Rewards Cards. The reason Chase UR and Amex MR are Variable Value Closed System Cards is because they both are able to turn into real frequent flyer miles through their transfer into programs such as UA (Chase) BA (Chase and Amex), DL (Amex) and many other programs. 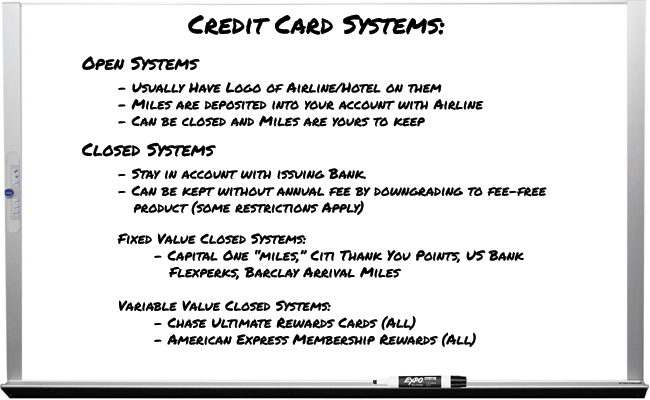 Once the miles are transferred into an airline program they function just like miles earned from Open System Cards. Everyone else says their card earns miles, but in reality Fixed Value cards earn proprietary points which are worth around 1 cent per point. Confused? The value of these Fixed Value Closed System points can also change, as Citi recently did, dropping the value of one TYP from 1.33 cents to 1.25 for travel redemption. Stay away from Closed System Fixed Value Points. I have a good friend who’s been chugging along for years with his Capital one Card. He’s so proud of the 90,000 miles he’s earned with the card. Sadly the value of those points is fixed– at $900. Had he been collecting Chase UR, say with a chase freedom, he could have gotten much much more use of those points, potentially thousands of dollars worth. Capital One tip: You can call in and tell them almost anything you bought was a travel expense to redeem for the full 1CPP. Alternatively you can book a refundable hotel room on your card, and when the charge hits refund it with Capital one Miles, and then cancel the hotel with the booking site. You’ll get the statement credit for the points, and a refund from the hotel. What about MR and UR points? what is the best way to handle these programs when you don’t want to pay an annual fee? I Briefly mentioned the solution for both but want to break it out and discuss it more in depth here. Chase Freedom: The Swiss army knife of UR points. Keeping a Chase freedom open will allow you to transfer your UR points into it, and keep that card open with no annual fee. As you apply for other premium UR cards you can then transfer your UR back out and use the flexibility of those Ink or Sapphire cards to get the UR points into a hotel/airline program. American express Blue (not the blue sky, not the blue cash, just Amex Blue). Downgrading a MR card to this allows you to keep your Membership Reward points safe and sound. The downside is you lose the ability to transfer them to Avios/Delta/Anyone else. But the card is a useful tool allowing you to hold your MR points safely without paying an annual fee every year. When you open a new premium MR card you can then transfer them out to an airline program. Every year you pay an annual fee the value of your points goes down by an amount equal to the annual fee less any benefits you received for that fee. Neither the Chase Freedom nor the Amex Blue offer much in the way of signup bonuses, so don’t apply for either, instead downgrade a better offer like a CSP or Amex Gold PRG. – Flexibilty in transferring points to other programs (MR, UR) to allow for variable rate redemptions. – Ability to continue to earn points in the system without an annual fee paying card. These points can then be transferred out upon opening of a premium version of the cards. – For spending in non-bonus categories the no annual fee Closed System cards (Amex Blue and Chase Freedom) earn just as many, or more points than annual fee based cards. If you’re spending in non bonus categories, the Amex Blue earns 1 MR point per $1 just like the Amex Gold. We’ve already looked at how the Chase Freedom can earn just as many, or more UR points than a card with an annual fee. Hopefully today you’ve not only learned a bit about the types of Credit Cards, but about the Milenomics terms for them, and you’ll start to categorize them in your head as Open and Closed Systems as well. Also, as you can see, there are plenty of ways to safeguard your miles without paying annual fees. Remember: Banks love sheepish consumers. #Milenomics are wolves.